President elect Gabrielle Deimeke won the election with 33.56 percent of the vote. She is currently studying abroad in London. Sophomore Jonathan Strauser said he thought there was a mistake when he learned the Student Government Association (SGA) 2014 election results. 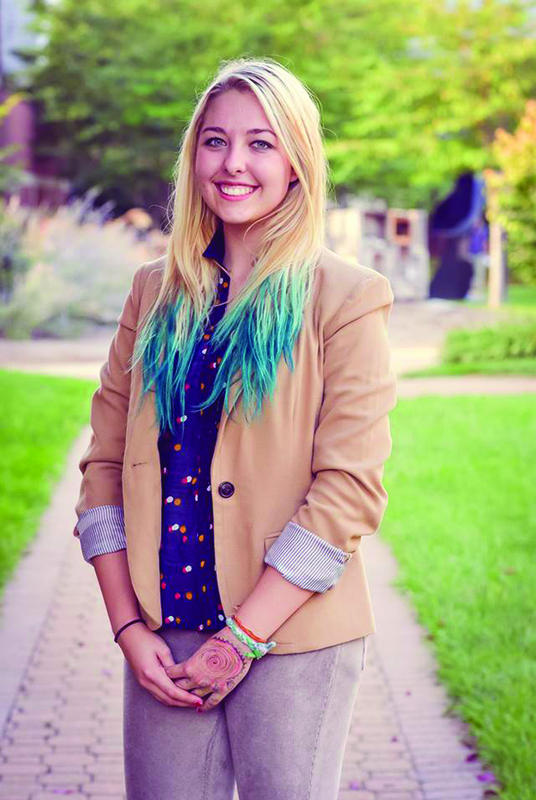 Strauser’s running mate, Gabrielle Deimeke, won the presidency with 100 (33.56 percent) of the 298 votes cast. But with only 126 votes cast in the vice-presidential race, Strauser lost to junior Jenna Hopkins by six votes. “My initial thoughts were that this couldn’t be true,” Strauser said. Like Deimeke and Strauser, Hopkins campaigned with her own running mate, junior Javier Cardenas. However, SGA election candidates run individually on the ballot. Cardenas lost to Deimeke by 15 votes, tying with fellow presidential candidate Caroline Wiley at 85 votes. Hopkins, who is a political science major, is studying abroad at Webster’s Vienna campus in Austria. She said without Cardenas’ help, she would not have run for SGA. While Cardenas campaigned for himself and his partner on the Webster Groves campus, Hopkins reached out to people through social media. Deimeke is studying in London this semester, while Strauser is in Cha Am, Thailand. The pair brainstormed and took photos for their campaign posters back in December. Friends attending the St. Louis campus hung their posters and, like Hopkins, they campaigned on social media. Strauser and Deimeke had worked together in the past through SGA and Delegates’ Agenda. Strauser said they know each other’s strengths and weaknesses. Since his defeat, Strauser said he realized the loss was for the best, because he had accepted a student ambassador position a week prior. He intends to still attend general SGA meetings when his schedule allows it, and hopes sustainability and wellness will still be a focus of SGA next school year. “Changes in these areas would better educate students of the benefits for Webster University and themselves,” Strauser said. Cardenas served as senator of arts and sciences the spring semester of his freshman year and the fall semester of his sophomore year. He lost the 2013-2014 presidential election to Michael Grosch, but Cardenas said “a desire to serve” motivated him to run again with his friend, Hopkins. Cardenas was elected senator of arts and sciences again via a write-in vote this election, though he was hesitant to accept it at first. “At first, when Jenn (Stewart) told me (about the write-in win), I was kind of hesitant if I wanted to be a senator again, just because I’ve been there. I want that upward mobility,” Cardenas said. Hopkins advised him to take the position, reminding him that if he did, they would be able to work together. Cardenas accepted. Cardenas said this presidential loss “hurt much less than the first time.” He has not ruled out running for the position again. “Right now our full focus is on helping Gaby fix the problems for the students, and that’s really where I’m going to be focusing for the next year, along with Jenna,” Cardenas said. Hopkins has not been involved with SGA in the past, but she said she took the surveys SGA sent out on a regular basis and offered ideas concerning changes she felt were needed on campus. During her term as vice president she said she would like to focus on three general topics: fundraising opportunities for campus organizations facing budget cuts, addressing student needs and improving student resources. Hopkins also hopes to see student involvement in SGA improve. Deimeke and Hopkins have never met, but Deimeke said she is excited to meet her and the rest of the new members. Deimeke was in Germany visiting with a friend when she found out she was elected SGA president. “I sent a message to my mom to let her know the news, and my friends were all really excited and supportive too,” Deimeke said. Deimeke said she believes students have the opportunity to improve Webster, and that is why she joined SGA. If she were not studying abroad, Deimeke would be sworn in at the last SGA general body meeting Tuesday, April 29. Since she will not be present for that meeting, current President Katie Maxwell will continue to hold the position through the summer. Maxwell said she has complete faith in Deimeke. “I really feel like people considered all factors when they made their decision for who to vote for,” Maxwell said.